I’ve had fresh cranberries on the brain! 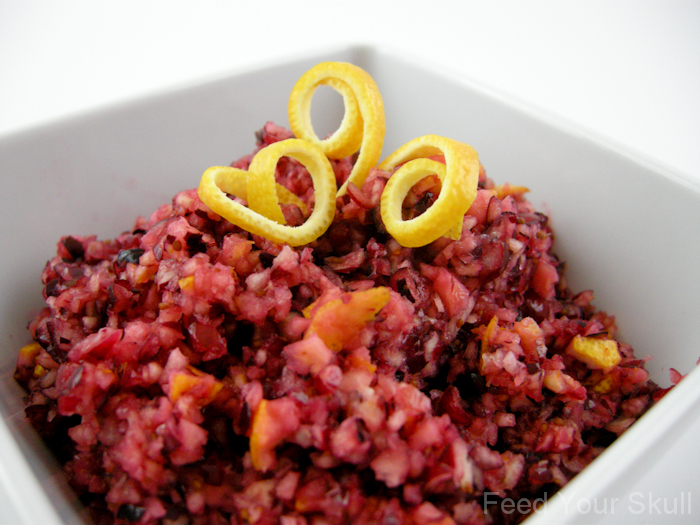 They came up in Mimi’s video the other day, when she made cranberry relish. Then I bought some because they had a nice big display at the store, 2 bags for $3 and thought I would make the relish. It is that time of year after all. I thought the texture and taste were perfect. It was tart and sweet but not too sweet. The best part was it only took about 5 minutes to put together. Jeremy thought the orange was a little too orange-y, at first, but the more he ate the more he liked it. Take that as advice if you want to make changes to not include all of the skin, because it does call for a ‘whole’ half an orange. If you include the skin, make sure you buy organic and wash it really well. This could be made a couple hours ahead of time and the flavors will really mellow out nicely. That being said – go for it! 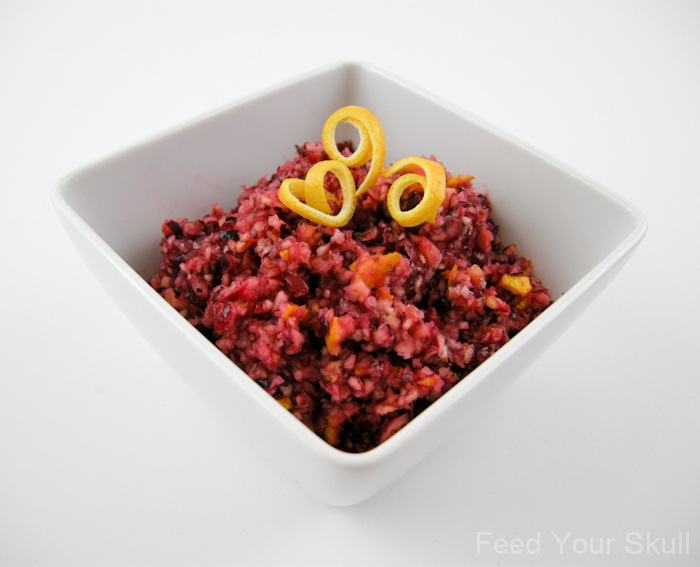 Add cranberries, orange, and salt to a food processor fitted with the s-blade. Using the pulse button, pulse until consistency is chopped. Finally add the the agave and lemon juice and pulse 2 more times to incorporate. Enjoy! We also used an apple in this relish growing up. Nice for added sweetness! An apple sounds like a great add-in! I’ll try that on my next go around. Thank you! !